You spend enough time on the job, the job bites back. Is David Ayer an on-again, off-again director or does he just get lucky despite himself? 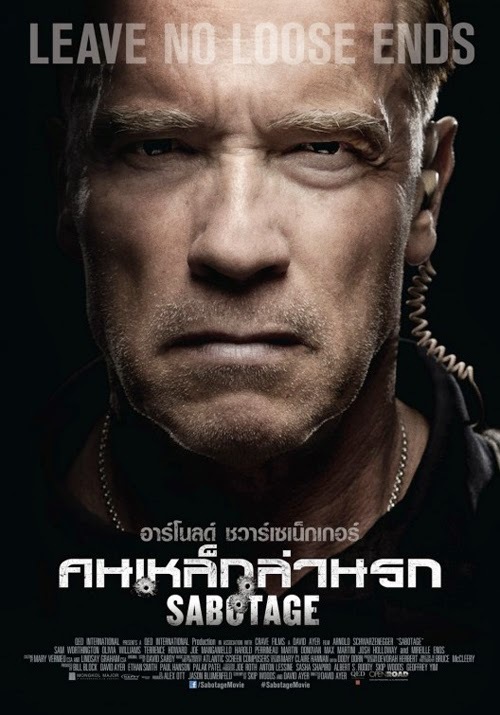 Sabotage comes along with such an apparent absence of basic filmmaking wiles, one ends up veering towards the latter conclusion; the behind the scenes wrangles might lead one to give him the benefit of the doubt, but this isn’t the first time he’s laid an egg. And, as the latest in Arnie’s damp squib of a comeback trail, it’s an ill-fitting suit for his persona yet one that’s so tone deaf as a whole his presence neither couldn’t be said to mar the surrounding material. Ayer’s debut Harsh Times, coming off the back of acclaimed screenplays for Training Day and Dark Blue, had a number of things going for it, not least a strong performance from Christian Bale at its centre. Likewise, End of Watch worked to Ayer’s lack of strengths as a director (to the untrained eye he has no clear sense of where to place the camera, how to edit or pace a scene, or even a grip on rendering basic narrative trajectory) by adopting first person/found footage gimmickry in one of the few big screen examples that actually works. I’d presume Ayer, being a veteran and all and a proper guy (the kind who puts lily-livered actors through boot camps and getting them all barking appreciation at how he encouraged them to feel like real men), is aiming for a rawness and immediacy in his approach. The danger with that is, if you aren’t absolutely clear about what you’re aiming for and why, the results end up looking clumsy or plain amateurish. In that sense Sabotage is a lot like Street Kings, only less proficient. Street Kings is a mess that, even though it feels like the natural relative of Sabotage, Ayer didn’t write (he probably did a pass over it, though). In both movies you have a less-than-esteemed actor (there Keanu, her Arnie) trading against an ensemble of both great and curiously cast peers in a cop movie about dirty officers and honour and the gap between. I have a lot of goodwill towards Keanu, but he doesn’t quite stick in that one. Few do, however. Chris Evans is great, but he usually is. 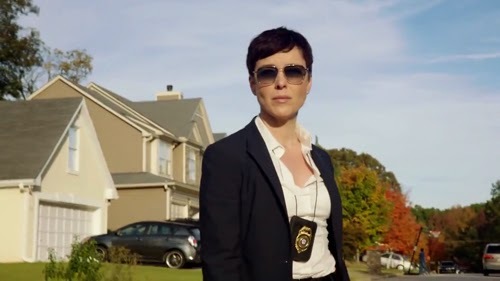 Hugh Laurie took the peculiarly cast Brit part, which is here commandeered by Olivia Williams as a no-nonsense, acerbic homicide cop with a wandering accent who has to deal with Arnie’s reprobate semi-feral DEA task force. She also has to make out with Arnie, which will at least sets her up for chat show anecdotes for the foreseeable future (if not her entire career). 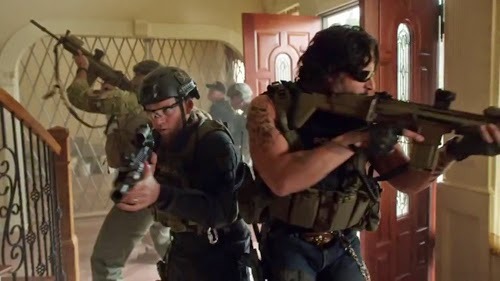 Sabotage announces itself as gritty and grim-faced but then embarks on an ever more excessive rampage of eviscerations and excitably explosive exchanges that are anything but believable. Ayer has shot himself in the foot with his eccentric casting but the concoction in general smacks of posturing and fakery, from the trying-too-hard crude talk to the nervy handheld camera and snuff videos. There’s something distasteful and borderline juvenile about the venture. If I were charitable, I’d lay the blame for the picture at the door of the producers who cut the movie against Ayer’s wishes, but there seems to me to be zero chance that this picture conceals a thee-hour director’s cut of assured tone and carefully arbitrated performances. The plot scarcely makes sense to begin with, and only becomes less intelligible as the picture progresses. That the picture is one great botch up at least means Ayer gets to claim he was stitched up. The unseemly and incoherent plot, in brief, has Arnie’s John “Breacher” Wharton and his team under investigation after some loot goes missing from a drug cartel’s safe house. Who was actually responsible (they took it alright, but then someone whisked it away from under their noses) is anyone’s guess, but it’s soon looking very much as if the cartel knows all about what they’ve done as the team steadily loses members one by one, their entrails unspooled to scenic effect. What is actually going on is so ridiculous, it’s barely worth your time attempting to figure out, and Ayer appears to believe several miles of intestines are an appropriate substitute for a complete absence of suspense. The divide between the actors who have signed up here thinking they’re onto something good (a talent like Ayer!) and those who are desperate is probably 50-50. 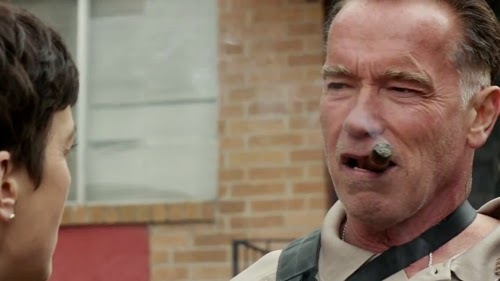 Arnie, of course, has never been able to do “natural” and is utterly adrift trying to exchange banter with fellows who can actually blend in (even if it’s in service of dross). He’s also so old now that his traditional lumbering gait has been reduced to crashing about with barely any coordination. His haircut’s very silly too. And he snogs Olivia Williams. Did I mention that? Poor silly Olivia. 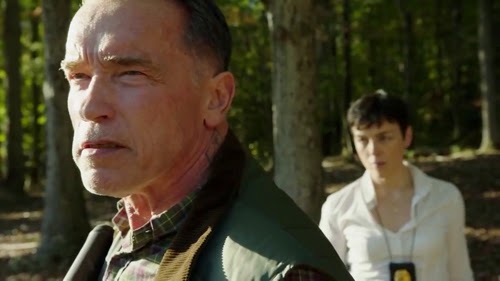 Arnie is a man out for revenge, but he’s not really selling it, and Ayer is banal enough to serve him up a Colonel Kurtz hand-rinsing scene when we flashback to his earlier bid for justice. 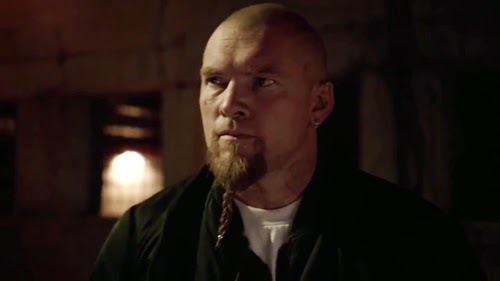 Sam Worthington, who clearly isn’t going to be the next Aussie big thing any more than Eric Banana was, is filling in as many projects as he can before James Cameron turns him blue again and saves his career. This time he grows a big busy chin beard in the hope it will distract from his inability to bring anything interesting to the table. He’s just too late to guest on Sons of Anarchy, which is a shame as he has much big screen presence as Charlie Hunnam. Big mad wolfman Joe Maganiello looks absolutely enormous even next to Arnie. He shouts and rages a lot, clearly attempting to imagine himself up there with the Austrian Oak in Predator but failing to realise this is several decades in quality apart. I guess nothing’s been quite the same for Terrence Howard since he lost the Iron Man gig. Josh Holloway is completely wasted. Which I don’t get, really; the guy has charisma to spare, so why not cast him in stuff? Then there is Mireille Enos who is utterly convincing as the utterly batshit crazy girl team member. However, it has to be said her macho-ing it up with the big boys in a sub-Vasquez Aliens manner gets old very quickly and finding out she has a drug habit gets even older quicker. Also on board is Lucas’ fellow Lost-er Harold Perrineau (“Waaaaalllt!”) who’s good fun as Williams’ partner, certainly much more than he was on that series, and Martin Donovan, who’s everywhere these days it seems but too rarely in a role that is actually worthy of him. Sabotage is a distasteful, unpleasant mess that reminds one of some of the less salubrious ‘80s action fodder, the Cobras of this world. It’s quite shocking how inept the debacle is. Ayer doesn’t so much ramp up action scenes at sets them off shambling and jerking about in a uncoordinated fit, accompanied by an undercooked score (from David Sardy) that sounds like a temp track drifting so far under the action you’d be forgiven for expecting a voice over to pitch in and start describing the scene. Blood seeps and pours and lacerates across the frame but to absolutely no impact. There’s a scene in which a cyclist gets bonneted on a car that proceeds to get ripped in half by a truck; in the hands of another director (Jack Sholder on The Hidden, say) this kind of hideous excess would be accompanied by a macabre sense of humour. Here it’s just ugly sensory overload to no end other than in and off itself. There’s a twist on top of the plot twist, but it leads to a scene so moronic you wonder if the reason this feels like an incoherent mumble is because Ayer and co-writer Skip Woods were making it all up as they went along.